There is beauty in the skies and health in natural lighting. This is magic that most people fail to enjoy because of enclosed roofing. Aluminium Roof Lanterns give you a flood of natural light during the day and a beautiful view of the stars by night. They are installed on commercial as well as residential spaces. The roof lanterns allow you to enjoy the relaxing feel of natural lighting. You can sunbathe while inside the house or enjoy the relaxing view of the sky by night without the danger of rain or direct UV sun rays. What Are Aluminum Roof Lanterns? Aluminum roof lanterns are daylight architectural features meant to provide natural lighting to the roof below. The use of the world lantern comes from the idea of the lamp that lights from above; when used on your roof, they eliminate the need for artificial lighting because they allow light to flow into the house. Technology has allowed them to offer more benefits than lighting and they are used to insulate the room as well as prevent energy loss. Their designs help you to complement the other features on your house, as the use of aluminum is meant to enhance durability. The lanterns form part of your roof and can be replaced with roofing sheets. However, there are benefits that are unique to using these roof lanterns. Here is a look at these benefits. Beauty– the lanterns are designed to provide unique architectural features that make your roof elegant. They are flawless when used as a part of your roof. They can be cut into different shapes and sizes and used to produce a unique roof section. 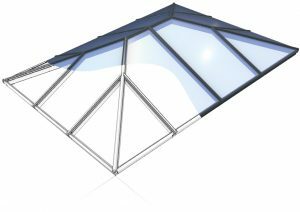 Strong- the roof lanterns have been designed with the latest technology and reinforced to provide a strong roofing for your house. Internal bracing and eaves ensure that the resulting strength is unrivaled anywhere. Insulation- the internal and external profiles of the lanterns are separated using the latest technology. This ensures that there will be no heat transfer. You can easily manage the heat inside the room without any loss through these lanterns. Waterproofing- a comfortable home is one where rain and wind are kept out. The lanterns keep away all water and any external element that might interfere with your comfort. This happens without eliminating natural lighting and the beautiful view of the skies from your house. Aluminum roof lanterns are also easy to fix since they do not require any special skills. They are durable to save you roofing expenses in the long run. They do not require any special maintenance and can withstand other installations like satellite dishes on the roofs. We provide the expertise to design, install, remodel, repair and replace your lantern roofing at a reasonable cost. At Premier Roof Systems we offer design, manufacture, supply and installation services for Conservatory Roofs, Roof Lanterns, Roof Windows, Windows and Doors to both trade and domestic customers. We aim for constant improvement by developing and widening our customer base in an attempt to build a stronger reputable brand that everyone recognises and trust.